When Arnold Schwarzenegger’s children left the lights on at home, he unscrewed the bulbs to teach them a lesson about wasting money and electricity. Reducing costs and increasing efficiency is a universal theme in the utilities sector for supplier and consumer alike. These goals are more achievable than ever before thanks to the Internet of Things (IoT), which is equipping once “dumb” devices with sensors that communicate with us and each other over the internet. The utilities sector presently faces a series of challenges. Ageing infrastructure desperately needs expensive upgrades, but margins are tight because of market deregulation increasing competition. A switch from the old models of generation to renewable ones is being driven by both consumer demand and government regulations. In addition, the traditional supplier-consumer relationship is also being disrupted as some people generate their own supply through solar panels and rainwater tanks. IoT technology helps utilities companies tackle many of these problems. Well-maintained assets are more cost effective, so many providers are using smart grids and other intelligent devices to monitor environmental factors like temperature, pressure, vibration and calibration. This data is analysed to identify leaks and other issues. For example, Canadian electricity supplier BC Hydro estimates that it loses $100 million a year due to theft (mostly by illegal marijuana growers). Analytics can be used to discover problems, say a lightning strike or machine failure, and quickly identify probable causes by comparing the data pattern of this event to others. The impact can be assessed and steps taken to minimise downtime or even avoid the problem in the first place. Sensor enabled machines can detect when a part is approaching end-of-life and text for a replacement before it fails. They can display safety instructions whenever an employee approaches dangerous machinery, minimising the risk of damage to equipment and its operator. Maintenance is also a lot cheaper when you can send a drone or robot down to monitor or repair hard to reach underground pipes, cables or wires. The IoT also helps utility companies deal with the changing market place. Alternative energy sources such as wind and solar might be better for the environment, but their sporadic output needs to be accounted for in generating a consistent supply. Smart meters will manage changing customer relationships as more people sell excess solar energy to the supplier or request an ‘on-demand’ service where they only take from the grid when there’s a shortfall. With rising prices and increased concerns about sustainability, it’s obvious that the old ‘set and forget’ model of consumption is changing. Smart meters do much more than reporting usage to providers. They arm consumers with information to make informed decisions about their usage, such as only running their washing machine when rates are low. New players in the market, such as the New Zealand-based online power company, Powershop, sends customers weekly emails about their consumption levels compared to the previous week and offering on-demand usage tools. Not that the traditional suppliers aren’t seeing it as a value-add, too. 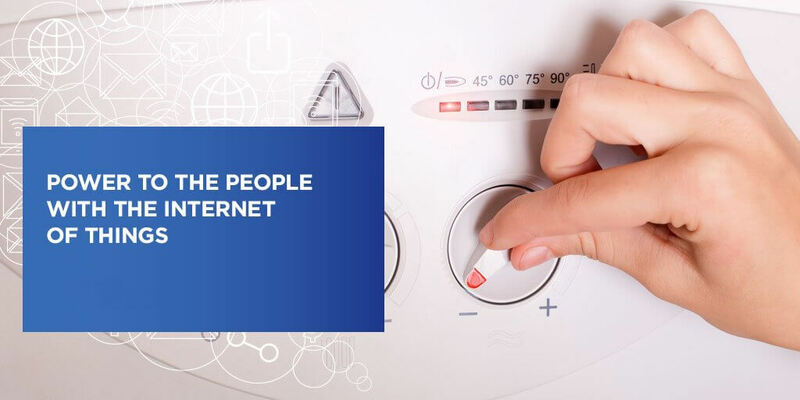 Last year British Gas acquired AlertMe, a company that develops platforms for smart devices, enabling customers to control heating and hot water remotely. There are even questions about further disruption to the market, with some predicting the possibility of an Airbnb-type model in the electricity sector, where people sell surplus solar power directly to others. Whatever the future holds, it’s clear that a utilities market powered by the IoT will lead to leaner, faster power companies and more informed, involved consumers. Download our free e-book to learn more about how you can power your business with IoT applications.